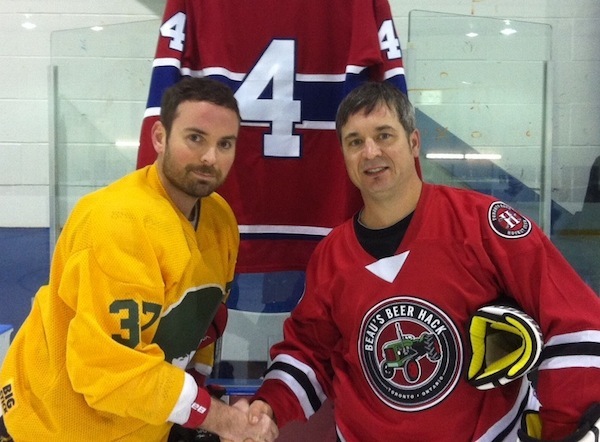 Wheatfield Souldiers forward Eric Toth and Beau's Beer Hack's David Laverdiere honour the late, great Jean Béliveau last Saturday night with a pregame handshake in front of the jersey worn by "Le gros Bill". The evening's slate of games was dedicated to the Montreal Canadiens legend who passed away earlier in the week. TORONTO - The Parkdale Hockey Lads blanked the Gas Station Islanders 1-0 this past Saturday night, putting the breaks on a four-game losing skid in the process. Meanwhile, the Wheatfield Souldiers doubled up on the Beau's Beer Hack 4-2 to extend their current winning streak to four straight games. The evening's program also saw the Jokers Hockey Club defeat the Brockton Rockets 4-1.